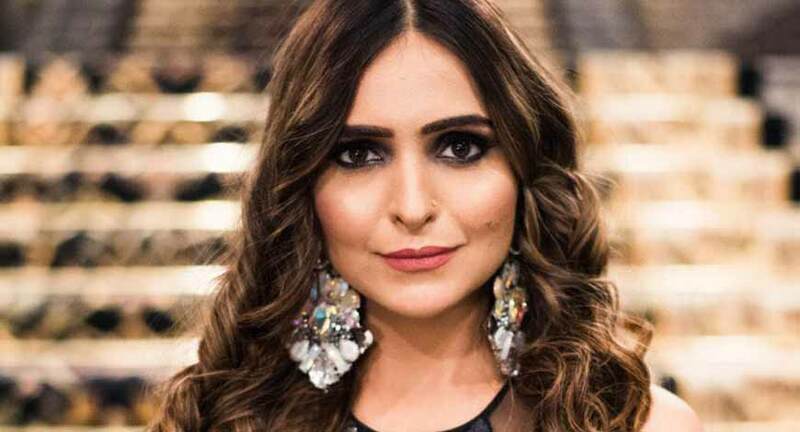 A recurring name amongst India's hottest event planners, emcee Sonam C Chhabra spent her formative years being raised in a humble household in "Dil Waalo Ka Sheher" Delhi. Hailing from a simple middle-class background, Sonam’s father runs a bookshop. “Hence my love for books,” she says. Her mother, a meticulous homemaker. Strikingly attractive and immediately intriguing, Sonam exudes a distinctive 'girl next door' vibe, juxtaposed with elegance and naiveté. "I lived an average life, but my ambitions were never average" she says coyly. Her rapid climb to becoming one of India's most sought-after event emcees is testament to that. She is the event industry's very own "Alice in Wonderland" because that is how she claims to feel every time she takes to the stage. A world of fantasy, possibilities, replete with travel and adventure. Having completed her education from St. Xavier's School, Sonam went on to study finance from Hansraj College in Delhi. Later on, she completed her Masters in mass communication. “They say the best things happen by chance, and that’s what happened with me too. I entered the world of anchoring by accident", reminisces Sonam, akin to how Alice first stumbled upon Wonderland. "It was at my college festival when the emcee didn't turn up at the last minute, that my friends urged me to fill up for her. That is how it all began, it was the call of destiny,” Sonam says. Going further down memory lane, references from her upbringing reveals what makes Sonam the person she is today. She says, “In spite of the fact that my parents didn't have access to college and much formal education, they instilled the love of books in me at a very young age. They pushed me to excel academically and value the luxury of education. I loved to read and hear stories which, in hindsight, played a key role in fuelling my imagination.” Sonam is currently pursuing her first year Ph.D. in mass communication. Being an emcee, you spend most of your time and energy on-stage. So we wanted to know how Sonam feels being on stage as an 'anchor' and more importantly the person to 'steer' the ship. Once again referencing Alice, Sonam says, “The stage has helped me discover and rediscover myself time and again. It has given me a voice and a medium of expression. Whenever I'm up there I feel like Alice, and the stage becomes my Wonderland”. Though it looks like a piece of cake to get up on stage, talk and go home with bags full of money, Sonam explains that it’s not THAT easy. Lots and lots of preparation is required to excel at any craft and emceeing is no different. “As an anchor one needs to be well informed and well read. I read extensively and that has helped me a lot. On stage there are no retakes, therefore to be a confident emcee is to be equipped with general knowledge and the ability to take on a curveball whenever it comes along. And there will be many”. Since she works with a lot of corporations, Sonam tries to catch up on financial newspapers and journals to keep abreast of happenings in the corporate world. Besides getting acquainted with hundreds of different stages, Sonam is a regular on equal number of frequent flier programs. "Travelling gives one perspective and I get most of my creative ideas while traveling. Due to extensive traveling, thanks to my job, I have learned about various cultures. These experiences enrich the mind which in turn, reflects in one’s performance,” added Sonam. While we have seen Sonam spinning magic through her words on-stage, we wanted to know more about Sonam off-duty. Sonam reveals, “Well, off stage, I am a very simple girl. When not on stage, you will mostly find me lounging around at home with a book in my hand. I try to spend most of the time with my family and take care of my dog. I am your simple girl next door girl"! Sonam's biggest achievements are not her multiple awards but being able to tick the boxes off her personal bucket list. "Up until very recently, we lived in a rented house. I take pride in having bought my father his dream home last year", says a clearly elated Sonam. Speaking about the hurdles that a person faces in their career, Sonam has an inspiring way of looking at challenges. She says, “I have never looked at anything as a hurdle. I feel challenges are an important part of the process of your evolution. They consistently push us to achieve a better version of ourself”. Sonam turns to Yoga to keep her sane when things get chaotic and grounded when Gods are kind. Letting us know about her future plans from here, Sonam explained that though she is going with the flow, and embracing experiences other than emceeing, like speaking at TEDx or walking the ramp, she is keenly keeping an eye out for opportunities in films or television.